The latest “rage” flooding through the social-media world is identi.ca, a Twitter-like micro-blogging service that is built on open-source servers and code. As with anything that becomes an overnight sensation, the problems of success tend to follow. Using GrabPERF, I have been monitoring the HTML download time of my personal message stream. The results have been interesting. willing to admit that it needs to grow. So, one-day never makes a performance trend. Over the last week, in my day job, I have watched a large online retailer suffer a similar fate to this newcomer to the social-media arena. 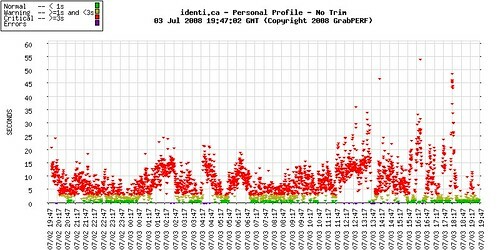 And if everyone who was willing to wait for Twitter to recover waited ten seconds for identi.ca to catch up, then there is a good chance that it may stand a chance of becoming a true competitor, pushing performance improvement. Plurk was a non-starter for the twitterati. Jaiku has lost momentum, and is failing Google in the same way that Orkut did. And Pownce…what is that? I hold out high hopes for identi.ca, if only to keep Twitter truly honest.